Turmeric root has been used for centuries as a powerfully healing plant, and is one of the most highly studied and widely used herbs today. 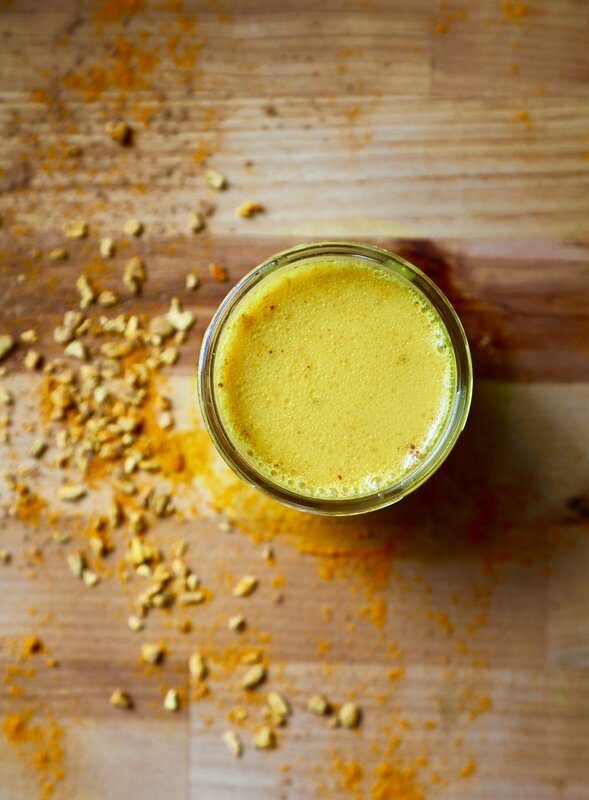 Although it is most widely known for it's anti-inflammatory and immune boosting properties, turmeric has an abundance of other qualities, making it both potent and versatile in its healing abilities. Like turmeric, cinnamon and ginger are used for their anti-inflammatory, immune boosting, and pain relieving properties, as well as their ability to improve and soothe the digestive system. Cinnamon is high in antioxidants, and has been known to slow and even reverse the effects of free-radicals in the body. Ginger is effective in increasing circulation, and has been used for centuries to increase cognitive function and enhance memory, relieve nausea and an upset stomach, and reduce inflammation. Black pepper is added to increase absorption and bio-availabitliy of the turmeric. Without black pepper, turmeric is very poorly absorbed into the bloodstream, and adding it increases absorption by 2000%! Turmeric is fat soluble, so the coconut oil also helps to increase absorption, and delivers its powerful nutrients to the joints and tissues. You can add honey or maple syrup to sweeten, but I like using raw honey because it contains live enzymes and other medicinal properties. Unlike filtered and processed honey, raw honey contains all of its live, active enzymes, vitamins, and minerals. It is both anti-viral and anti-fungal, and contains powerful antioxidants which can slow down and even reverse the effects of again and damaging free-radicals in the system. Raw honey is also beneficial in treating seasonal allergies, improving digestion, and reducing blood pressure. And it makes this Golden Chai taste delicious! Maple syrup tastes great too, contains anti-inflammatory properties, and like raw honey, is high in antioxidants. Step 1: Pour 3 cups of any milk substitute of your choice into a saucepan, and turn on heat to the lowest setting. Step 2: Stir in the turmeric, cinnamon, cardamom, ginger, coconut oil, black pepper, and cardamom. Step 3: Let the mixture heat up, stirring frequently, until it comes to a low simmer. Let it simmer on the lowest setting for 5 minutes, then turn off the heat. Cover, and let this steep for 10 minutes. Step 4: Strain out any cinnamon chips, ginger, or cardamom pods, and return to the saucepan. Step 5: While it's hot, stir in your vanilla and raw honey or maple syrup, sweetened to your taste. Especially if you are adding raw honey, be sure to just stir it in rather than simmer, as simmering will kill the live enzymes and reduce it's potent medicinal properties! Step 6: Sprinkle with a touch of cinnamon. To reduce pain and inflammation, improve digestion, and purify the blood, drink 1-2 cups of this Golden Chai per day. Enjoy! *Be sure to consult a your healthcare practitioner if you are on any medications. Do not take turmeric root if you are on blood thinning medication.